I have suffered from some unfortunate insomnia during pregnancy. When I wake up in the middle of the night, if I read for about an hour, I can usually manage to get back to sleep. But when it’s 4:00 in the morning, and you’re wide awake, you’re not looking for anything particularly deep or thinky or heavy. You want something fluffy and brainless. And, recently, this book fit the bill. Nick Hornby is probably best known for authoring books that have led to some pretty good movie adaptations (like High Fidelity and About a Boy). His stuff tends toward light, funny (in a witty, Brit-humor kind of way), and fast-paced, with just the right amount of sentimentality. These are fun books—perfect for summer reading (or middle-of-the-night reading, as the case may be). Funny Girl isn’t his best book, but it doesn’t stray from his signature style. Barbara from Blackpool is the titular funny girl . . . although, at least at first, she’s far better known for her figure and face than she is for her sense of humor. It’s the early-‘60s, and Barbara has done what all the other pretty girls in Blackpool have done: she has entered the Miss Blackpool beauty contest. She is “miles prettier than all the others,” but right before she is about to be crowned, she realizes, “She didn’t want to be a queen at all. She just wanted to go on television and make people laugh.” Becoming Miss Blackpool would mean another year tethered to Blackpool, and she can’t have that. So, Barbara turns down the crown and sets off for London to become the next Lucille Ball (“That bloody Lucy woman,” her father said. “She’s got a lot to answer for.”). At first, Barbara is broke and working at a cosmetics counter in a department store, where her fellow counter girls give her the sage advice to use her good looks to find “a rich man with a wife” to help her get a leg up. Her first foray into the world of the “gentleman friend” is a disaster, but it leads her directly (and utterly randomly) to meet Brian Debenham, a theatrical agent, who sees a spark in Barbara immediately. Brian only wants to send Barbara to auditions where her pretty face will land her some work, but Barbara has other ideas. And Barbara has a knack for being in the right place at the right time. The only script that is seeking a young female that Brian has received is a Comedy Playhouse, one of the “one-off half-hour shows that the BBC used as a launching pad for new comedies. If the crits were good and the BBC were happy, then sometimes the shows become a series.” Barbara is on board, but Brian has his doubts—the audition is for the lead. I was a little nervous when I first downloaded this book and saw how long it was. But I need not have been discouraged. One of Hornby’s strengths is fast pacing, and this book, like his others, reads very, very quickly. Also, some of the pages are taken up by random photographs sprinkled throughout the book (usually used to provide some helpful context to some of the names and places referenced). There is nothing particularly deep about this book (although, in parts, it aims to be). A beautiful chick from Blackpool finds celebrity . . . and realizes that both beauty and celebrity are fleeting. But, while the focus is on Barbara (who becomes Sophie Straw when she manages to land the lead in a show called Barbara (& Jim)) and her rise to fame, the heart of the book is in the various relationships among the cast (especially Clive, the shallow and big-headed star who plays Jim), the writers (one openly gay and scornful of his work on a comedy about marriage; the other ambiguously gay and married to a woman, who loves his work and the show), and the director (a somewhat uptight, but super nice, champion of the show). There are friendships and affairs, some of which are fleeting and shallow, others of which are long-standing and complicated. The book spans too much time (decades) to delve into any of these relationships with significant depth, but it features specific, meaningful moments in time that attempt to highlight the complexity of the Barbara (& Jim) “family” dynamics. So, the book, as a whole, comes off as a little too trite and a little too convenient. One positive note that bears mentioning: although Barbara/Sophie is a touch naïve and a little too trusting, she is beautiful, smart, ambitious, optimistic, and funny—a winning combination for a female protagonist (especially one written by a man). Who should read it: fans of British humor, I Love Lucy, and Nick Hornby’s other books. 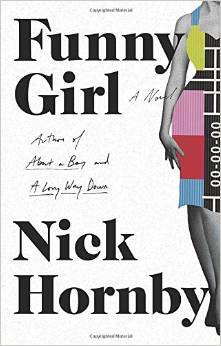 This entry was posted in Rating: 2.5/5 and tagged Book review, Book Reviews, Books, Funny Girl, Nick Hornby. Bookmark the permalink.